If you are in an office that needs a powerful copier that can do everything you need it to, while keeping everything easy and streamlined, then look no further than the Ricoh Aficio C5502. This powerful machine is the perfect addition to your busy office that needs a reliable and high quality multipurpose copier and printer to tackle any jobs you give it. The Ricoh Aficio C5502 is a multipurpose color copier, printer, scanner, and facsimile machine with a user-friendly touchscreen interface that simplifies even your most complex jobs. With a warm-up time of less than 24 seconds and a color print time of 55 prints per minute this gorgeous printer can print high quality, professional materials in no time at all. The powerful networks connections let you wirelessly print from most mobile devises simply by downloading the app, and offer a USB port and SD card slot for convenience. 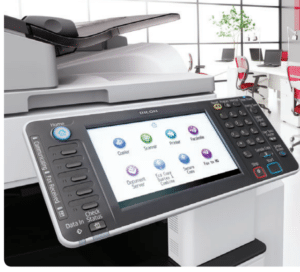 It can also scan and email full color documents straight from the copier itself to allow for instantaneous connection and sharing of files. It can also protects all the files that are scanned, copied, and sent through the Ricoh C5502 with the optional Data Overwrite Security System that wipes your hard drive of all images and data stored in the HDD. Many are not aware, but hackers can get a wide variety of private information over copiers that store these in the internal hard drive. This safety feature can protect you and your customers from horrible difficulties down the road. The Ricoh Aficio C5502 is the perfect machine for a diverse set of busy offices. Contact your local Philadelphia copier representative to learn more about our available copiers.